NAGA CITY—The Bicol State College of Applied Sciences and Technology (BISCAST) played host to the Naga City leg of the roadshow of the Presidential Communications Operations Office (PCOO) Monday morning. PCOO Sec. Jose Ruperto Marin M. Andanar, who delivered the keynote speech, explained that the roadshow aimed at ensuring an extensive reach for the Information, Education, and Communications Campaign and engaging the public on the initiatives and achievements of the Duterte administration. At least 500 participants from the national and local governments, non-government organizations, the academe, and the media attended the event. Also part of the PCOO roadshow were discussions by several key speakers, including PTFoMS Executive Director Jose Joel Sy M. Egco, PCOO Assistant Secretary for Policy and Special Concerns and FOI Philippines Program Director Atty. 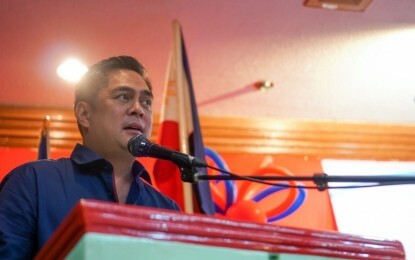 Kristian R. Ablan, and PCOO Assistant Secretary to the Office of Brand Integration Ramon L. Cualping III. Among the objectives of the roadshow were to increase media and information literacy to promote responsible handling and sharing of information and end the proliferation of fake news. It also aimed at informing stakeholders of government efforts to enhance the protection of the local media through the Presidential Task Force on Media Security; educating the public on Rehabinasyon, the government’s all all-encompassing campaign against illegal drugs, through the Office of Brand Integration; raising of civic awareness on transparency and accountability in governance through the Freedom of Information Program; and partnering with education institutions to include the FOI Program in their curricula, and promote FOI as an academic tool for research. A ceremonial signing of a Memorandum of Understanding for the Implementation of the FOI Program in Schools was led by Sec. Andanar and BISCAST OIC Dr. Isidro R. Bola. The event was in partnership with the Philippine Information Agency Region V, the local government unit of Naga City; and the state schools in Camarines Sur. Following the Naga City leg of the event, the roadshow will proceed to Legazpi City for the same event at the Bicol University.